Part of the Aspen Fields Development accessible from Barclay Hill Road, this rural, 33-acre open space provides a walking trail from Sebring Road to Todd Road. The trails at Aspen Fields were constructed by Maronda Homes, Inc. during their development of the Aspen Fields Plan. 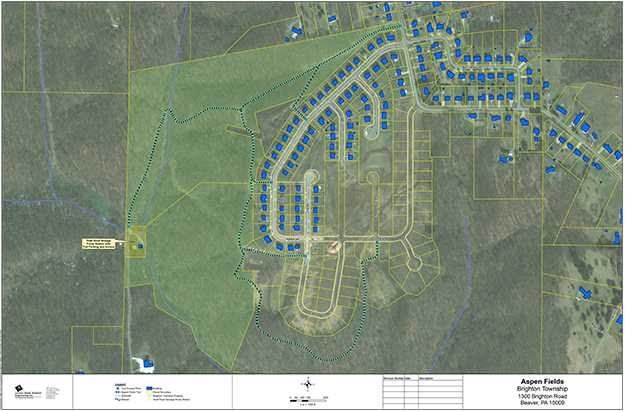 There are over 1.5 miles of trails constructed around the perimeter of the housing plan. The trail has many up and down slopes which can be challenging for some walkers. Four Mile Run Creek is located at the lower end of the trail. Pets on leashes are permitted. To date, over 60 acres of open space area has been dedicated to Brighton Township by Maronda Homes, Inc., with additional acreage to be dedicated in the future. Address: Access points are available to the trail system from several points within the Aspen Fields Plan as identified on the map. The trail can also be accessed from Sebring Road, near Aspen Drive, and from the end of Todd Road off of Barclay Hill Road.